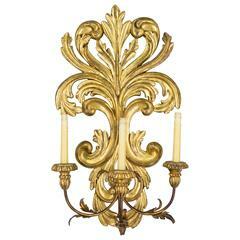 A pair of Italian Palladio style gilded wood two-light candle sconces with framed mirrors. Carved with ribbons, swags, and tassels with warm gilt finish. Each with two gilded metal candle arms. Electrified with new sockets and a ground wire will need to be added by the electrician. Good Original Condition - Professionally electrified. 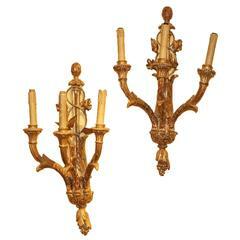 Pair of French three-arm electrified sconces with cast brass oval back plates depicting classical figures. A pair of Italian midcentury carved giltwood wall sconces of stylized swags. Nicely carved and water gilded. A pair of giltwood candleholders with iron prickets. The finish is beautifully "chippy" with missing gold leaf throughout. Pair of Italian giltwood sconces with mirrors, circa 1950.